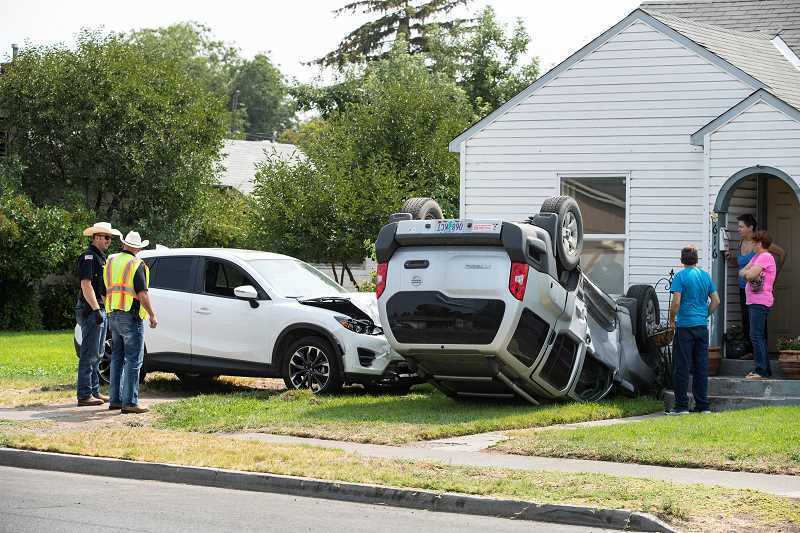 A vehicle collision that flipped a parked SUV onto its top in a residential neighborhood Tuesday afternoon has been attributed to a medical condition. Prineville police and emergency personnel from Crook County Fire and Rescue responded to the crash, which was reported shortly after 1 p.m. at the 600 block of Northeast Seventh Street. There authorities found an overturned 2011 Nissan Xterra resting in the front yard of a residence, its front end making contact with the house. Alongside the Xterra was a 2016 Mazda CX5 that had sustained significant front-end damage. An investigation revealed that the driver of the Mazda, whose name was withheld by police, was traveling west on Seventh Street, when they experienced an undisclosed medical issue and drifted across the eastbound lane. The Mazda went over a curb, and traveled through a couple front yards at a high rate of speed before colliding with the driver side of the XTerra. "The impact was hard enough to cause the parked vehicle to slide west from its parked location, before the passenger side tires sunk into the grass causing it to roll over," said Prineville Police Cpt. Larry Seymour. Both vehicles sustained significant damage, police reported, and the home's gas meter and possibly its exterior siding was damaged during the crash. Seymour pointed out that tire marks in the grass show the driver didn't appear to make any controlled or uncontrolled attempts at swerving or stopping, bringing more credibility to the crash being the result of a medical condition. The driver was transported to St. Charles Prineville with what emergency personnel believed to be non-life threatening injuries. The vehicle's airbag deployed, authorities stated, and the driver appeared to be wearing a seatbelt. No citations were issued, but the case will be forwarded to the Department of Motor Vehicles.